This seems like a redundant question. However, it seems important to recognise that vitiligo is a disease according to the World Health Organization. particularly when the face and the hands are involved. Leukodermas of other origin are for example the Sutton Nevus also called Halo-Nevus. Despite both vitiligo and Sutton nevus can occur together at the skin of the same individual, it has been shown that these are two very different diseases (Schallreuter KU et al Arch Dermatol Res (2004) Future work needs to show why both vitiligo and Halo-Nevi frequently occur together. New Biol (1972)). It is becoming evident that besides melanin formation many other mechanisms and factors are in place to defend the human body against environmental reactive oxygen species (ROS) formation (Schallreuter KU and Wood JM Photobiology (2001)). ROS can also be generated by ultraviolet light directly inducing a plethora of signalling and defence mechanisms. In vitiligo patches the pigment is mostly completely absent, but not all individuals suffer from sunburn despite sun exposure (Schallreuter KU et al, Dermatology (2002)). that some other protective mechanisms must be in place to yield this result. However, it is also beyond any doubt that excessive sun exposure over time can induce non melanoma skin cancer (NMSC) in general in susceptible individuals. Malignant Melanoma (MM) is another skin cancer which can be very dangerous if not recognised early. There are many reports linking this malignancy with altitudes and excessive periodic sun exposure. People with very fair skin (those who never tan or only very slightly) do have a higher risk to develop melanoma compared to dark skinpeople at any body site regardless of sun exposure or not. These tumours can develop in existing moles but they can also arise totally new as pigmented as well as non-pigmented tumours. Early recognition and excision are important for the outcome. The observation that melanoma is more frequent in patients with vitiligo originates from a study which included 623 Caucasian patients with melanoma of the Oncology Clinic at the Department of Dermatology at the University of Hamburg/Germany (Schallreuter KU et al, Dermatologica (1991)). In this study 11/623 patients with melanoma had a true vitiligo long before their melanoma was diagnosed. Considering that 1 in 200 has vitiligo and 1 in 12,000 develops melanoma, these results suggested a significantly higher risk to develop melanoma for patients with vitiligo and fair skin (Schallreuter KU et al, Dermatologica (1991)). In our Institute for Pigmentary Disorders we have indeed found in 2 Caucasian patients with vitiligo melanoma in a patient group of 1800 Caucasian patients with vitiligo supporting the above findings (Schallreuter KU, unpublished results). Based on the above results the take home message and recommendation is that patients who have vitiligo should undergo an annual total body examination at their Dermatologists in order to recognise a possible melanoma as early as possible. leucoderma seems more appropriate as already suggested earlier by the late Fitzpatrick. Are white skin patches associated with melanoma beneficial for the outcome? The development of white patches anywhere on the skin in association with melanoma was interpreted to be a beneficial sign in the outcome for survival time. There is still an ongoing debate whether the development of such leucoderma associated with melanoma is of true value for the individual’s outcome or not (Lerner AB, Nordlund JJ Arch Dermatol (1977); Nordlund JJ, Lerner AB Arch Dermatol (1979); Nordlund JJ et al J Am Acad Dermatol (1983)). Thisauthor feels that there is at the present time not enough evidence to support this statement. Larger patient groups are needed in order to conclude. Therefore, it is simply not correct to advise patients with vitiligo that they have a decreased risk to develop melanoma and that they are well protected against this tumour. 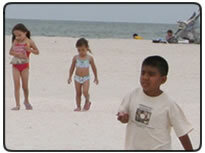 The development depends on the genetic background and on the accumulation of sun exposure times / sunburns over time. In this context it is noteworthy that fair skin people who always burn and never tan are much more prone to develop skin cancer compared to good tanners and dark skin coloured individuals. But there are also exceptions. Even dark skin people can occasionally be very sun sensitive. The result of two major studies showed that patients with vitiligo do not have a higher risk to develop sun induced skin cancer (Calanchini-Postizzi E and Frenk E (1987) , Schallreuter KU et al (2002)). In the recent past an issue was put forward that PUVA therapy which is a frequently used treatment modality for vitiligo could be of potential risk to enhance the risk of skin cancer and their precursors (actinic keratosis) in these patients (Halder RM et al Arch Dermatol(1995)). Considering the amount of rays, which these individuals receive, it seemed reasonable to question the possible side effects. However, until now there is no documentation in the literature about a true coincidence. (Westerhof W and Schallreuter KU Clin Exp Dermatol (1997)). A recent publication by Grimes states that there is also no enhanced risk after the use of narrowband UVB exposure which is a treatment modality utilised as mono therapy with increasing doses 2-3x per week in adults and even in children (Grimes P, JAMA ( 2005)).